Scott, I'll ask the obvious question. If we adults were mostly in agreement that God does not exist, would you be on board with lying to children about that as well? It seems like it could be even better than the Santa story for the valuable effects you attribute to it. Hi Randy, the Santa story is just enough to demonstrate the folly of faith without risking greater unnecessary social harms. I would not lie to children about God, because there isn’t only one story and too many people take the stories so seriously. The negatives outweigh the positives. We have had this natural experiment with irreconcilable god stories and authorities for a millennium and its malignant capacity for inspiring divisiveness and viciousness is well-documented. I’d rather we did not tell kids that any gods exist and then just model compassion and teach ethics and logical reasoning without magic and superstition. Perhaps it is true that people just can’t be good without (believing in) God, I don’t know, but it is worth a try. But don't you think that answer is ignoring my stipulation that we're all mostly in agreement that God doesn't exist? The harms you cite all stem from the assumption that God exists I think. Santa is a kind of demigod. I don't understand, but I agree about the harms, I think. Do you mean tell kids (a) “God exists” even if we adults don’t believe it? Or, do you mean (b) tell kids “God does not exist” even if we adults don’t believe it? Both are pernicious because they don’t meet minimal evidence standards. Demigod, as in lesser god? Sure, but God is overdetermined for the thought-experiment. I agree that not all instances of lying are wrong - even if deontology is true, which might or might not be for all I know -, but I'm not sure this one isn't. While you list potential benefits of this lie, there are potential negative effects. I would say that one such potential effect (of course, I don't expect Christians, Muslims, etc., to agree) is that someone who believes in Santa has - just on account of that, and in addition to other false beliefs they have -, a very skewed picture of how the world works. This view is not only false: it's also far removed from the truth, and in the particular way of holding that an agent with superhuman powers is involved in their daily lives. It may very well predispose a person to have other beliefs of that sort, like the belief that Jesus walked on water, resurrected, etc., and/or that they have a personal relationship with him. Those beliefs - unlike the Santa belief - are held by many people (even very intelligent philosophers, who defend them with the tools of philosophy), and they are much more difficult for many people to shed than the Santa belief. In other words, it might backfire. It's unclear to me whether chidren are more likely to be immunized against faith-based thinking by the Santa belief, than they're likely to be more vulnerable to it. How about the following alternative? Instead of lying to them, one could explain to them that Santa does not exist, and that the parents of the kids who are Santa believers know that perfectly well, but they lie to their children. Additionally, one can point out that given (for example) the mutual incompatibility of the world largest religions, it's apparent that millions of parents also pass on false beliefs to their children - even if, in this case, believing it's true. That alternative might cover the positive points, without the risk I mentioned above. A variant (it depends on the kid and her age, maturity, etc.) would be to not tell them whether it's true at first, but rather, ask them whether they think their peers are right in their Santa belief, and why - then one can guide them to the truth, but with some input on their part. Hi Angra, I don't think it is easy or best to explain why something does not exist. That's too hard. Better to review the reasons for believing something exists, then decide. So I like your last alternative, it inspires kids to think for themselves. It works best on older children who can reflect and question but I think not so much on 2 to 4 year-olds. They are capricious and are little more than parrots about belief-states. I just don't want to tell kids what they should believe. Better to allow them to be deceived for a little while and to then help them resolve it for themselves later. Fair enough, but if you don't want to tell kids what they should believe, then wouldn't that support not telling young children either that Santa exists or that he doesn't? Usually, when parents tell their children that X is true, they're implicitly telling them that they should believe that X is true. To say that myths are “just stories” is like calling an armored division “just a bunch of guys in Really Cool Vehicles”. It so understates the power of the thing as to constitute a hopelessly misleading description. And rebellion against the prevailing establishment - being 'countercultural' - has, across history and cultures, involved refraining from meat. What’s the explanation for this universality? It’s not natural, obviously; chimps don’t pour libations. It seems to have been part of the cultural toolkit of that small group of behaviorally modern humans from which we are all descended. The tool is a particular set of stories we tell about the world, our place in it, and what we must do in order to thrive and not Bring Down Bad Stuff. The developmental psychology of all human beings is surprisingly similar across all cultures and all times. So these stories ‘form’ our cognitive system, in some as yet unknown but seemingly literal way. Social movements have power and influence, seemingly, to the extent that they can piggyback on pre-existing mythic cognitive structures. This was manifest in the Marxist theory of history: it’s a redemption story. The fanaticism of some climate change activists relies, I suspect, on the urge toward apotropaic sacrifice. Rene Girard died just two weeks ago, a scholar very much alive to the power of myth. His studies drove him into the Catholic Church. If there are these historically contingent deep mythic cognitive structures, then it may be a mistake for us to inquire as to whether they’re true or false. They would be (to coin a really ugly phrase) ‘infra-truth-apt’. They form our access to the world, through which judgments of truth or falsity are made possible. These considerations don’t help with Santa, unfortunately. We can’t help but transmit the deep myths, just as children can’t help being receptive to them. So, regarding Santa, that shallow, village-atheist critical account of the function of religion applies: Belief in Santa is a means of social control. We have to have someone to threaten the little ratbags with. Tom, you only say that it may be a mistake, so I'm not sure how seriously you mean for this to be taken, but I wonder if the fact that we are capable of seriously inquiring into the truth or falsity of a myth is a reason for thinking that we can deal with the conclusion that it is false. If we can't, maybe the power of the myth would immunize us against concluding that it is false in the first place. I don't completely believe this, because I tend to feel that people who "see through" myths often go embracing another one that is just as obviously false. (Like born again atheists who start evangelizing about homeopathy, localvorism and the evils of immunization.) I love the term 'apotropaeic.' I was not familiar with it. We can isolate some particular mythic story and put it to the question. But we do that by employing our cognitive structures as a whole, which are mythic at the roots. I think it's sort of like trying to taste your own tongue. The phenomenon you describe, the apostate who rejects certain truth claims but from an unchanged archimedean standpoint, I take to be evidence that there's no getting 'underneath'. There is something right about what you are saying. The fact, if it is a fact, that people need to see their life in narrative terms and make decisions in light of that narrative, would at least cohere well with this view. But then I don't think either of us would want to argue against the possibility of a process that changes this. I think you would just want to say that if that were to happen, then we would no longer be human, which is fine since I anticipate a transhuman age and I bet you do too. Perhaps we can isolate particular cognitive structures and change them, and in accord with Neurath, end up with a significantly changed cognitive system. We've learned from epigenetics that it is hard to change our genes, but we can actually change their level expression, and that is really a major part of the diffence why we are so different than bunnies and chimps. 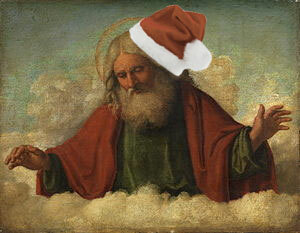 Hi Tom, I agree that myths are powerful and useful, it's why I say spread the myth about Santa. This is compatible with some of them also being false yet illuminative epistemically, in retrospect. Myths are not trivial. My point was to acknowledge those among us who dismiss the Santa lie as a harmless myth and just tell it for fun. The Santa story is more important than that, which I think you will agree. Angra, you say "Usually, when parents tell their children that X is true, they're implicitly telling them that they should believe that X is true" and perhaps this is often so. However, it is not what I recommend or imply. We can tell someone what we believe, with or without giving reasons, and not expect or imply that others should believe it also. We can tell them we believe is zombies or ghosts and then tell them to examine the evidence for themselves. We can tell them we don't believe in gods or demons and then tell them to examine the evidence for themselves. I believe P is not a (good) reason for you to believe P.
I would say that whether your belief in P is a good reason for me to believe P depends on the circumstances. Granted, that factor alone - without any background, circumstances, etc. - is not enough. But the case I was talking about was the case of parents telling children that X is true (not only that they believe X), and also, in the case of children and parents, the circumstances are usually such that the fact that the parents tell children that they believe X is in most cases a good reason for those children to believe X, in my view - that's one of the normal ways in which children learn. Regarding the option of telling children one believes in ghosts, zombies, etc., and asking them to examine the evidence, as you mentioned earlier, that might work better for older children, but not for 4 years old children (for example). When it comes to older children, it might work, but still, telling them that one believes in ghosts, zombies, etc., provides some evidence in support of the hypothesis that they exist. I'm not sure it's okay to provide such evidence. While I think telling them one believes they exist and ask them to assess the evidence for themselves is less problematic than just telling them they exist (since at least it asks them to see for themselves, which is good), I think it's generally better to just ask them to assess the evidence, without telling them what one believes.